PROGRESS at LONG LAST! The Chief Engineer has explained that the construction project has a 120 day completion timeline… Thanks to Jeff Davis for these most recent photos which demonstrate that the building design we approved back in 2014 is indeed being followed. Today I will be attending a TOB Planning Dept hearing for a new McDonalds restaruarnt proposed for the front pad of the King Kullen shopping center in Middle Island, the same place where the axe-wielding robbers struck the laundromat last Friday morning, where the Chinese restaurant was broken into, and where the SubWay was robbed at gunpoint. I’m sensing a trend here, folks. And it’s a terrible one. I will still speak in favor of the project — our civic approved it more than a year ago. But I am very concerned about the safety of workers and patrons at any establishment in this center, as well as others along the Middle Country Road corridor. The dry cleaners and the bagel store in the Key Food center to the west were robbed recently, too. Is there private security at these places? If so, how often do sector cars interact with them? I did indeed testify in favor of the new McDonalds that is planned for the front pad of the KK site, but I added the details of the axe-wielding robbers into my concerns for the project. After the hearing, I then met with Roger Delisle of Island Associates, owner of the site. He expressed equal horror at the recent events and said he was expanding the private security there. We also talked about the need for more good tenants, and he said he is hoping for a new gym/fitness center to fill the old Habitots space. He also agrees with our desire for a real sit-down restaurant there, a place where you can watch the game, have a beer and enjoy a good meal with family and friends. 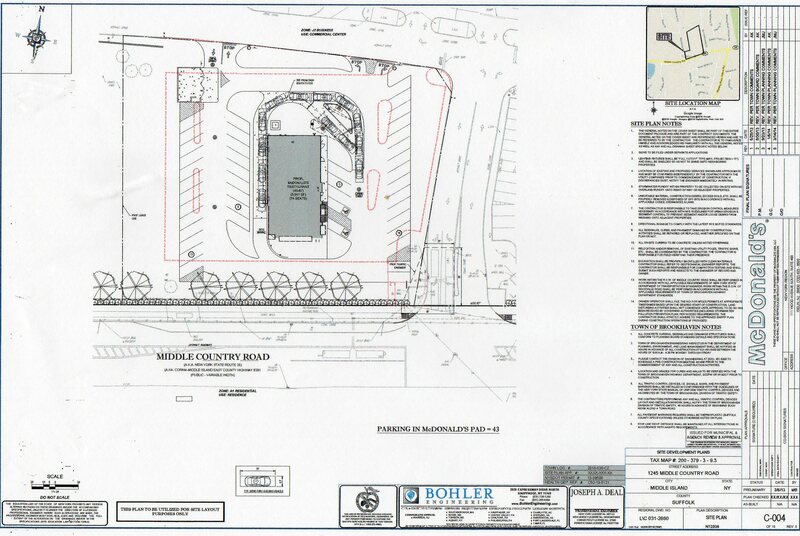 UPDATE: At the Public Hearing held on Thursday, Nov. 13, 2014, the Brookhaven Town Council approved the special use permit for a drive-thru restaurant for McDonalds in Middle Island. The next step will be site plan approval from the Planning Board; MICA and the 4th Council District will monitor and participate in this process to ensure that the litter and noise mitigation plans are thorough and in place prior to construction. Job retention is certainly one factor in approving the revised plans for the proposed McDonalds in Middle Island (above). So is the potential revitalization of the King Kullen shopping center, and indeed that section of the Middle Country Road corridor — improvements so many agree have needed to happen for far too long. MICA voted to oppose the original McDonalds plan in April: we didn’t want them to abandon the Ridge location, the design they offered was bare bones industrial, and there were no noise, litter or traffic mitigations involved. Basically, members of both MI and Ridge civics were puzzled as to why the apparently successful Ridge site was going to be vacated. Many area residents, though, decried MICA’s opposition as anti-business; they asked us how we could possibly turn down a business willing to relocate to the King Kullen center, especially since the Longwood Library will be leaving its temporary headquarters there sometime in summer 2015. We held firm even after the Ridge Civic was informed that McDonalds would be leaving the Ridge site no matter what transpired in Middle Island. In response to correspondence in late July from McDonalds’ attorney Keith Brown, as well as his numerous inquiries with the Town of Brookhaven, MICA met with TOB Planning Commissioner Tulio Bertoli, Councilwoman Connie Kepert and Chief Planner Chip Weibolt on August 14, 2014. There we crafted a substantial list of design critiques and other amenity requests. After weeks of negotiation, McDonalds responded. They offered a design more consistent with the area (gabled roof, colonial design, mullioned windows and muted colors), a new building orientation (front entrance actually facing Middle Country Rd -see below), increased plantings and fencing along the entire front of the shopping center, a new bus shelter across the street, as well as noise, litter and traffic mitigations. Coupled with the fact that MICA had not hosted a presentation from owner Peter Hunt nor attorneys from BrownAltman at the time of the opposition vote, the MICA Board agreed that these substantial changes warranted a special meeting to consider the revisions. After securing the use of ballroom meeting room facilities from our MIFD hosts, we invited Ridge Civic officers,Woodville Road residents, and the owner of the Ridge parcel McDonalds currently leases, to join us on November 6, 2014. Members in good standing were mailed meeting notice postcards, and MICA’s long email list recipients were also invited, depsite the fact that so many on this list are still not current with their membership dues. The meeting was posted on MICA’s website, its Facebook page, the Longwood Community News Group and the Brookhaven News Herald. The presentation lasted over an hour, with MICA members and guests receiving individual copies of the new building elevations and orientation for personal review. Many questions were asked, and most were answered. There is no loss of open space or existing trees; more trees, in fact, will be added. The operating hours will be the same as in Ridge. Actual construction will take about four months. Those working at the Ridge facility will be offered transfers to the new location upon completion. There will be no outdoor seating or play areas. The project will be dark skies compliant – no huge golden arches or polluting uplights allowed (this applies to all plans in Brookhaven now, too.) The lease with Island Associates will be for twenty years. Much of the continuing discussion centers on litter, traffic and noise remedies, with special concern given to the residents of Woodville Road. Artificial noise absorbing materials are a distant possibility, but natural plantings seem to be preferred by most in attendance, many of whom thought this would also eliminate potential surfaces for grafitti. Although the vote to support the revised plans was not unanimous, it did pass by more than a 2-1 measure. The project requires a special permit from the TOB and other approvals. And MICA will continue to monitor and negotiate as the plan moves forward, all while fending off the latest round of public and social media attacks from the other dissatisfied side of the aisle. The Ridge Civic is already working to secure an alternate eatery with the Ridge property owner. His frank assessent of the situation gives us cause to be optimistic: McDonalds has every right to seek to operate a business wherever they choose, and they’ve certainly been a great tenant for twenty years in Ridge.